An application will display a very realistic animation of crocodile (alligator) on the screen of your phone. An animal will move and look very natural. Frightening sounds of reptile will come from the speakers of your phone. 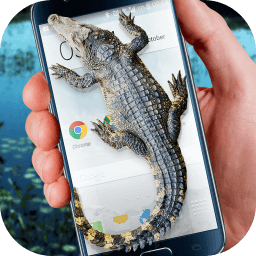 Many people may be pranked that a real crocodilian is walking on the screen of the phone. A simulation of crocodile will be displayed over all applications. No matter what you will be doing on your phone, play a game, read mails or watch videos, a virtual croc will always be visible. Any application can’t cover it. Additionally we give you possibility to set size of the animal and time after which it will appear on the screen. Removal of notification icon in the top Android status bar is also a very useful setting. After choosing this option an icon will be transparent. Thanks to it your victim won’t notice that in a moment a giant crocodile will appear on the screen of the phone. 1. Borrow phone from your friend under pretext of e.g. calling your mom. 3. Set delay time e.g. for 10 seconds. Press: “Show Crocodile”. 4. Give the phone back and ask your friend to check e.g. the weather forecast for you. 5. After 10 seconds a scary alligator will appear on the screen of the phone. Novelty! You can also release a reptile using your watch (Android Wear). You only have to press an icon of reptile on the smartwatch and an animal will appear on the display of your phone.